One of the favorite hairstyles for the ladies is the bun and it seems that no matter what happens it will never be old-fashioned. This is so because there are many ways to do your hair on the so called knot. On top of that this hairstyle is so good that you can use it in absolutely any occasion. With a bun well done you can create for yourself a wonderful elegant or business look, classy and romantic style or you can even do your hair on a knot for your everyday activities. It all depends on the certain effect that you need to achieve. You probably have one or two of those girlfriends who are doing their hair by themselves and every time you see them with a great and unique hairdo you think that this is something impossible or that you will never be able to do this by yourself. However, the truth is that it is not that complicated as it looks. With some easy ideas and tricks you are going to forget about the expensive hairstyles at the saloons and your outstanding appearance will be guaranteed. And all kind of ornaments for hair that you think can make your hairstyle interesting. You can even use some scarves. Another thing that you have to consider is the type of your own hair. For example, if your hair is thin and delicate you will handle it better if it is clean and washed right before you start with your hairstyle. But in case it is thick, volumetric and restless you better wash it a day or two in advance. Here you are going to find some versions of buns which eventually will become your favorites and you will do them with pleasure whenever you are going to some kind of official event or to a Sunday walk with a friend. The hair sponges, also known as “donuts”, are a buzz nowadays and are very practical. You can find them in different colors and sizes, so make sure that you get the right sponge color that matches your hair color. As for the sizes – it is better to get at least two or three different ones, because each of them will give your hairstyle a different completeness. So now, brush your hair and gather it on a ponytail. Then put your hair through the hole of the donut and spread it carefully so that it covers every part of the sponge. This is very important moment of this hairstyle and now you will know why the right color of the sponge is so crucial. If your hair is thin you will not be able to cover the sponge properly and some of its parts may remain visible, so you will not get the right effect. After you have covered the donut with your hair you can clamp it with a rubber band. Then all you have to do is to hide the remaining hair. 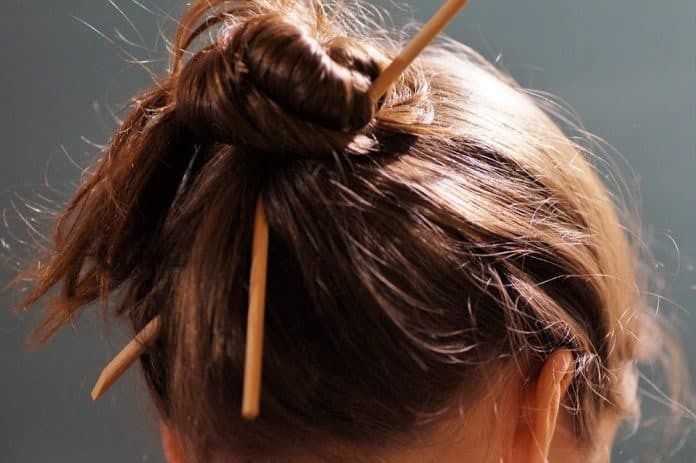 You can do that by simply twist it around the basis of the bun and fix it with some bobby pins. If your hair is very long you can try to do the endings into a braid and then clamp it. This kind of bun is simple but elegant and you can use it for business meetings or some official occasions. In case you want to make it a bit more casual just wrap a thin scarf around the sponge basis that matches your clothing and there you go. This way you will combine the elegance of the knot with some playfulness. Finish your hairstyle with some hair spray. This bun is suitable for medium or long hair. If you are looking for a bit more interesting effect, the sponge may again come in handy. This time you need to prepare your hair by curling it before you do it up. It does not matter if you use a flat or a curling iron. After you have curled your hair just try with your hands to make the curls messy and then put some hair spray on. Then you are ready to repeat the steps with the ponytail and the donut. This time do not clamp the hair. Use some bobby pins to fix the remaining hair around the sponge. Do not try to make the whole shape of the bun too perfect. The idea here is to make it look casual. You can also pull out some tufts and let them fall nicely around your face. The lower buns are really unique and will give femininity and delicacy to every woman. The only difference in their making is that you need do your ponytail on a lower position. One more thing – if you want to add some elusiveness to your appearance – make a side ponytail right below one of your ears. And again – if you need your bun to be not too official just do all this on a curled hair. High buns, on the other hand, would contribute to one classy and stylish look and they are usually considered as formal hairstyles. This is why you need to assess the occasion pretty well. This bun is easy to be done as it is almost the same as the others. You need to gather your hair on a really high ponytail this time and then shape it over the sponge with bobby pins. The only important thing for this bun is that you have to gather your hair up very well so that it will not be falling by itself. In this version of a bun you do not need a donut. You only need long hair. First you have to chose the exact position of your bun and then do the ponytail there and fix it with a rubber band. Make a braid from your ponytail and then gently pull the sides of the braid starting from bellow. This way you will make is look bigger and thicker. All you have to do now is to wrap the braid around the rubber band and fix it with bobby pins and hair grips. This bun is neat and classy but still a bit different from the usual. Now, this is one interesting suggestion which is quite unusual and cheerily. It is a great decision for ladies who are keen on the not-so-classic ideas and it is very easy to be done. But before you start you need to know that the completion of this hairstyle would be a challenge if your hair is curly, so you may need to straighten it. The beginning is the same – get your hair on a ponytail. The best position for this bun is a middle position – at the level of your ears. Then you have to divide vertically the hair from the ponytail in two parts. You also need to separate one small tuft from the top of the ponytail and keep it apart for now by just clamping it with a bobby pin to the front of your head. Now you need to backcomb these two parts from the inner sides and just fold them to your head. Smooth the hair if necessary and clamp the parts with bobby pins. You are almost done with your “ribbon”. Use a second mirror to see how it looks and if you have to you can just make the sides of the ribbon a bit wider with your hands. Take the small tuft that you left aside before and place it between the ribbon sides. Fix it with bobby pins around the rubber band. Keep in mind that this type of bun may take you longer than the others but the result would be worth it. Just be patient and do not quit if you do not succeed at first. The “Ribbon” bun is doable on a medium and long hair. Every single bun hairstyle is absolutely wonderful and every woman would feel perfect if she could do them by herself. As you already know, it is not too hard to learn how to do your own hair on a bun. Try out these ideas and you will see that you can always have interesting and unique look. Of course you have to remember that there are no mistakes – your best tool is your imagination. Be creative and use everything that you can think of and you will be amazed by the results.